Retargeting is a form of online targeted advertising directed to users who have visited your website, but left without completing a desired action (purchase, deposit, sign-up, etc.). PropellerAds’ pixel-based retargeting solution helps you reconnect with this audience and show them personalized ads. How to start using it? 1. Login to your PropellerAds Advertiser account. 2. Go to the "Audiences" Page. 3. Click the "Create Audience" button. 4. 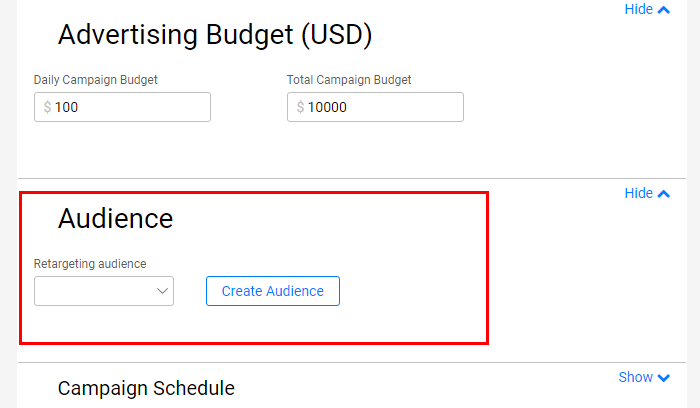 Give your audience segment a short name and click the "Create Audience" button. 5. A pop-up window with the tracking code will appear. Click "Copy Pixel Code" to copy it. Please note: you can always find the tracking codes by choosing the related audience from the list and clicking "Get code" link. 6. Choose the page(s) of your site to collect the audience from which you would like to target and place the code between the body HTML tags (<body></body>) on the page(s). 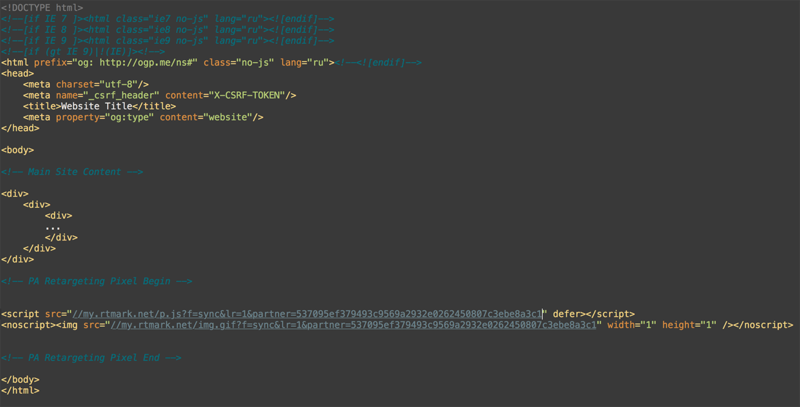 You can use the same tracking code on all the pages if you want to add all your site visitors to the same audience. If you want to separate the visitors of a specific page(s) into a certain audience, you will have to create a new audience and use a new tracking pixel. Please note: Make hyper-targeted audiences by using different tracking pixels for visitors of specific page(-s). For example, you can create an "abandoned shopping carts" list and remind window-shoppers about their incomplete transaction or forgotten goods. 7. As soon as you add the tracking code on your site or pages, it activates automatically and immediately starts collecting data to form your audience. Please note: We recommend to create a retargeting campaign after you collect at least 30-50 users in your audience. 8. Go to the "Campaigns" page and create a new campaign. 9. Adjust your campaign’s settings and move on to choosing targeting options. You will find the list of your audiences among the available targetings. Choose an audience you want to target from the list (or click the "Create Audience" button if you want to use a new one). Please note: You can combine your retargeting audience with any other targeting options to make your campaign even more effective. For example, choose one of your retargeting audiences and "Mobile" targeting options to display ads only to mobile users who have visited your site. 10. 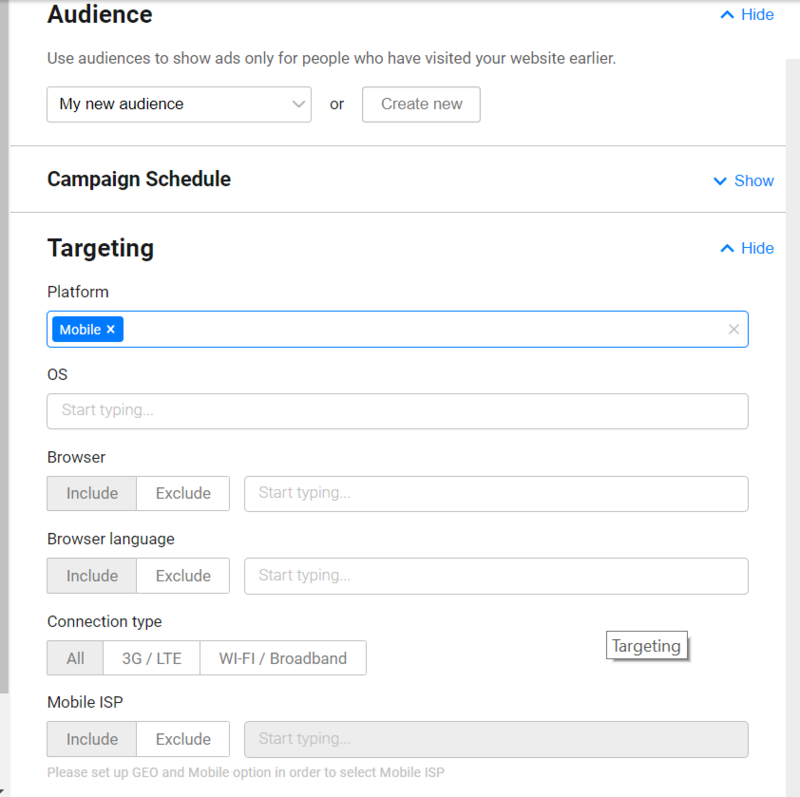 Check your campaign’s other settings and click the "Start Campaign" button to run ads (or click "Save as Draft" if you want to launch it later). Congratulations! 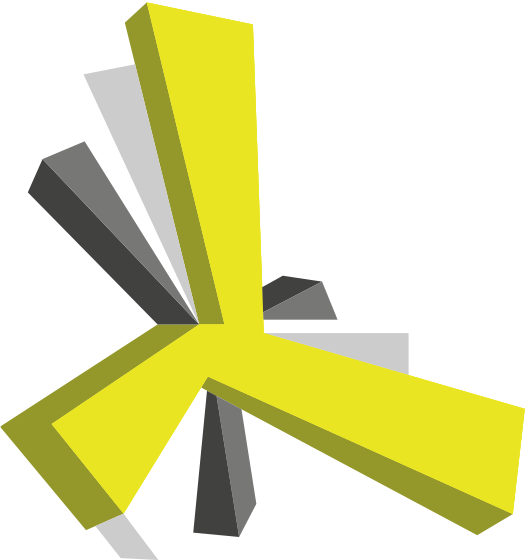 You’ve started promoting your product using PropellerAds Retargeting solution! If you experience any issues with installing our pixel or setting the audience targeting, please contact your manager or our support team from within your account. How to exclude a user from audience? Important! Don't forget to replace partner ID "000000" with the partner ID matching with the one you used earlier to include users to the audience (take it from the code you get on Step #5). From now on, anyone who will visit the "Thank you page" will immediately be removed from your retargeting audience and will automatically be excluded from seeing the campaign ads in the future.